Wonder Woman is a 2017 American superhero film based on the DC Comicscharacter of the same name, distributed by Warner Bros. Pictures. It is the fourth installment in the DC Extended Universe. The film is directed by Patty Jenkins, with a screenplay by Allan Heinberg and a story by Heinberg, Zack Snyder, andJason Fuchs. Gal Gadot stars as the titular character with Chris Pine, Robin Wright, Danny Huston, David Thewlis, Connie Nielsen, and Elena Anaya in supporting roles. Wonder Woman is the first live action theatrical film starring the character, following her first live-action theatrical appearance in 2016’s Batman v Superman: Dawn of Justice. Set in 1918, the film tells the story of American pilotSteve Trevor, who crashes offshore of the Amazon island of Themyscira, and is rescued by its Princess Diana. After he tells Diana about World War I, she leaves her home in order to end the war, becoming Wonder Woman in the process. Development for the film began in 1996, with Jenkins signing on to direct in 2015. Principal photography began on November 21, 2015, with filming taking place in the United Kingdom, France, and Italy before wrapping up on May 19, 2016. Additional filming took place in November 2016. Wonder Woman premiered in Shanghai on May 15, 2017, and was released in the United States on June 2, 2017, in 2D, 3D, and IMAX 3D. It received positive reviews from critics, with many praising Gadot and Pine’s performances and has grossed $254 million worldwide. In present-day Paris, Diana Prince, a staff member of the Louvre‘s antiquities department, receives a World War I-eraphotographic plate couriered by Wayne Enterprises and recalls her past. Diana was born and raised on the island of Themyscira, home to the Amazons, a race of warrior women created by the gods ofMount Olympus to protect humankind against the corruption of Ares, the god of war. In the distant past, Ares slew all his fellow gods, but was mortally wounded by his father Zeus. Before dying, to guard against Ares’ return, Zeus left behind a weapon for the Amazons capable of killing his renegade son—the “Godkiller,” which Diana believes to be a ceremonial sword. Diana desires to train as an Amazon warrior, but her mother Queen Hippolyta refuses to allow it, insisting that Ares will never return. However, Diana and her aunt, General Antiope, disobey Hippolyta and begin training in secret. When the two are discovered by Hippolyta, Antiope convinces the queen to allow Diana’s training to continue. As a young woman, Diana rescues pilot Steve Trevor after his plane crashes off the coast of Themyscira. The island is soon attacked by the German soldiers pursuing Steve. The Amazons engage and kill all the soldiers, but Antiope dies protecting Diana. Interrogated with the Lasso of Truth, Steve reveals that the Great War is well underway, and he is an Alliedspy. He stole a notebook from German scientist Doctor Maru, who is researching a deadlier form of mustard gas under General Erich Ludendorff. Believing Ares is responsible for the war, Diana arms herself with the ceremonial sword and leaves Themyscira with Steve to find and destroy Ares, although Hippolyta refuses to let her return to Themiscyra. In London, Steve delivers Maru’s notes to his superiors at the Imperial War Cabinet, including Sir Patrick Morgan, who is trying to negotiate an armistice with Germany. Steve believes Ludendorff will complete and use the gas regardless of an armistice. With Sir Patrick’s support, Steve and Diana infiltrate the Western Front in Belgium, accompanied by Steve’s team: spy Sameer, marksman Charlie, and smuggler Chief. Find Wonder Woman and see the new trailer here. Pirates of the Caribbean: Dead Men Tell No Tales (also known as Pirates of the Caribbean: Salazar’s Revenge) is a 2017 American fantasyswashbuckler film, the fifth installment in the Pirates of the Caribbean film seriesand the sequel to On Stranger Tides (2011). The film is directed by Joachim Rønning and Espen Sandberg from a script by Jeff Nathanson, with Jerry Bruckheimer serving again as producer. Johnny Depp, Kevin McNally andGeoffrey Rush reprise their roles as Jack Sparrow, Joshamee Gibbs and Hector Barbossa, respectively. The film also stars Javier Bardem as Armando Salazar,Brenton Thwaites as Henry Turner and Kaya Scodelario as Carina Smyth. The film also features the returns of Orlando Bloom and Keira Knightley as Will Turner and Elizabeth Swann respectively, following their absence from the previous movie, On Stranger Tides. The filmmakers cited the series’ first installment, The Curse of the Black Pearl(2003), as inspiration for the script and tone of the film. Pre-production for the film started shortly before On Stranger Tides was released in early 2011, with Terry Rossio writing a script for the film. In early 2013, Jeff Nathanson was hired to write a new script, with Depp being involved in Nathanson’s writing process. Initially planned for a 2015 release, the film was delayed to 2016 and then to 2017, due to script and budget issues. Principal photography started inAustralia in February 2015, after the Australian government offered Disney $20 million of tax incentives, and ended in July 2015. It was released in conventional, Disney Digital 3-D, RealD 3D and IMAX 3D formats on May 26, 2017, received mixed reviews and has grossed $514 million worldwide. 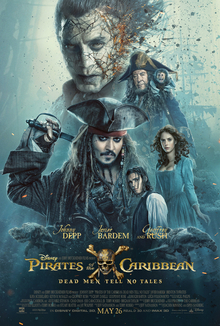 Two years following the post-credits scene of At World’s End, 12-year old Henry Turner boards the Flying Dutchman to inform his father, Will Turner, that the mythical Trident of Poseidon is able to break his curse and free him from his ship. Will does not believe the Trident exists and orders Henry to leave his ship and never come back. Nine years later (and five after the events of On Stranger Tides), Henry works on a British Royal Navy warship. While chasing a pirate ship, Henry realizes the captain is about to sail them into the Devil’s Triangle. The captain dismisses his concerns and has Henry locked up for attempting mutiny. As they sail into the Triangle, they come across a shipwreck that quickly comes to life with undead sailors, led by Captain Salazar. The ghost crew board the ship and kill everyone in their path. Henry is confronted by Salazar, who sees a wanted poster for Jack Sparrow in Henry’s cell. He allows Henry to live so he can deliver a message to Jack that death is coming his way. In Saint Martin, a young woman named Carina Smyth has been sentenced to death for witchcraft because of her knowledge ofastronomy and horology. She manages to escape her cell and briefly runs into Jack, who is in the process of robbing a bank with his crew. Jack and his crew manage to evade the British Army, yet they realize the vault they stole is empty. Jack’s crew abandons him for being unlucky and not delivering any loot. Carina later meets Henry, who has also been sentenced to death for supposedly committing treachery aboard the vessel of the Royal Navy, and tells him she knows of a way to find the Trident. She helps him escape, but gets caught by the British Army. Feeling depressed after losing his crew’s support, Jack goes back to town and inside a local tavern. Having no money to pay for his drink, he reluctantly trades his mystical compass. This causes the Devil’s Triangle to crumble and allows Salazar and his crew to sail the seas freely. Soon afterwards, Jack gets caught by the British Army. Before both he and Carina can be executed, Henry helps them escape with help from Jack’s crew, and together they sail away on Jack’s ship, the Dying Gull. Carina reveals a map that will lead them to the Trident, and reluctantly decides to team up with Henry and Jack in order to achieve their goals; Carina and Henry grow closer as their adventure progresses. Salazar and his crew are roaming the seas and destroying ships in Captain Barbossa‘s fleet in their search for Jack. Barbossa decides to meet Salazar and offers to help find Jack in exchange for sparing his fleet. Salazar explains to Barbossa how he and his crew once sailed the seas to kill every pirate. They were undefeated until they ran into a young Jack Sparrow, who tricked them into sailing into the Devil’s Triangle, where Salazar and his crew died and were cursed to remain undead. Jack’s mystical compass was the key to freeing them from the Devil’s Triangle; letting go of its ownership would unleash the owner’s worst fear. When Salazar’s ship finds the Dying Gull, Jack, Henry and Carina escape on a rowboat while the crew remains on board to cause a distraction. Salazar and his crew chase Jack, but upon arriving at a small island, Jack realizes Salazar’s ghost crew can’t step on land. Barbossa arrives at the island and decides to help Jack; he breaks the Black Pearl out of the bottle and returns it to its original size. With Jack’s compass, which he had managed to locate, Barbossa takes command of the ship and lets Carina navigate them to the island. Find Pirates of the Caribbean: Dead Men Tell No Tales, and see the new trailer here.